Judged as a BJCP Category 10a American Pale Ale. Big, juicy, citrusy hops upfront that feature notes of orange, tangerine, and some tropical mango. Aroma is very citrus forward, although there are some hints of piney hops in the background. There is substantial malt presence that is very bready and offers a whisper of sweetness. The fruity hops and malt sweetness combine for an almost candy-like impression. No alcohol or other off-aromas present. Clean fermentation. Deep gold with some orange hues. Capped with a persistent white head. Beer is quite hazy. Each sip fills the palate with big, juicy hops that are very citrus-forward. This is balanced against a substantial, sweet and slightly, toasty malt character. The beer is a touch sweet, which is accentuated by a bitterness that is low for the style. On the finish there is a bit of a minerally astringency that detracts. Medium-full bodied. Again, a touch of astringency on the finish detracts. The carbonation is a bit low, which gives the beer a very creamy mouthfeel. This is a nice citrus-bomb American Pale Ale. Unfortunately, the beer is a bit under-attenuated giving the beer some undesirable sweetness and excessive mouthfeel. Additionally, the water feels overmanipulated and minerally. In the future, I will dial back my water additions and make adjustments to this recipe that will lead to better attenuation. 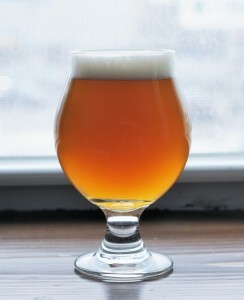 This entry was posted in Homebrew Tasting and tagged ale, american beer, american pale ale, apa, beer, homebrew, homebrewing, review by Nick Ladd. Bookmark the permalink.